Last week, Caesars Entertainment made a monumental announcement that they no longer support “bad actor” clauses as they pertain to online poker. Furthermore, they also reversed their opposition to PokerStars entering the United States market, claiming that the Amaya Inc owned company should be allowed the chance to apply for a license. On Monday, CIE went one step further and announced a partnership with Amaya that would see the companies work together to further online poker legislation in the United States. This new partnership is expected to have many benefits to the fledgling iGaming market and could eventually benefit New York iGaming. Sheldon Adelson is seeking to ban all iGaming in the United States through his Restoration of America’s Wire Act (RAWA) bill currently in Congress. He failed last year in his attempt to have such legislation passed but some feel that there’s a strong chance that the bill could pass in 2015. It is important that this bill is stopped because it would not only criminalize online poker moving forward but would also serve to destroy the market already in place. Online gambling would be illegal even in states that have passed it. 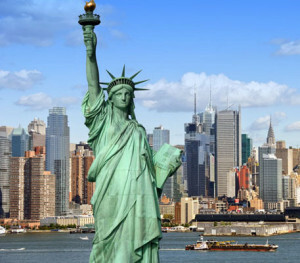 Now that two of the industry’s largest forces have joined together to support iGaming legislation, it could have a serious influence on New York state lawmakers. Last year’s bills included a bad actor clause that would have banned PokerStars from operating in the state. However, many believe that bad actor clauses were primarily influenced by other factors including opposition from major casino brands. Caesar’s change of heart is a monumental shift in the industry, meaning that PokerStars is no longer seen as the enemy, but an ally that could help the game. This attitude could well trickle down to lawmakers and stakeholders that will consider the issue. If one of the largest live gambling companies can have a change of heart, then perhaps the company should be reevaluated. The true litmus test will be once a new bill is filed in New York. Should it contain a bad actor clause, then Amaya and PokerStars will have to work with lawmakers to show that they are not a threat to the industry. If the bill is devoid said clause, then we can assume that the partnership with Caesars had a positive influence and may eventually lead to the largest online poker site operating in the state. Tagged Caesars, Caesars Interactive Entertainment, New York Online Poker, New York online poker legalization, New York Online Poker Legislation, PokerStars. Bookmark the permalink.